Last week I was in Cleveland for a meeting and thought I’d pop into the Morgan Conservatory to take a look around. Wow. 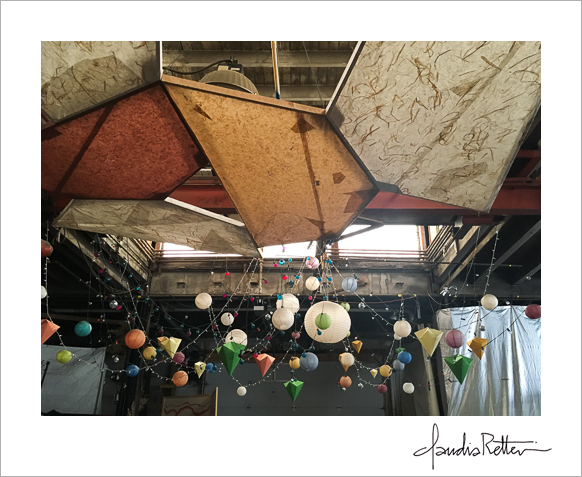 Papermaking, letterpress, AND book arts under one roof? … I’m all in! The Morgan is the largest art center of its kind in the nation, with 15,000 square feet of industrial space that combines “a working studio, gallery, gathering place for the community, educational hub and purveyor of some of the finest handmade papers in the world.” It sponsors artists in residence, offers workshops, and even has its own garden out back that’s home to trees and plants used for papermaking and dyeing. There’s even a kozo harvest in November! The first thing you notice when you walk in is all the paper sculptures and mobiles hanging from the ceiling. So festive! It makes me want to make some for my own house (like I don’t have enough projects already). Allie was kind enough to give me a little tour. The Morgan has a separate room for bookbinding and a huge dedicated space for letterpress. 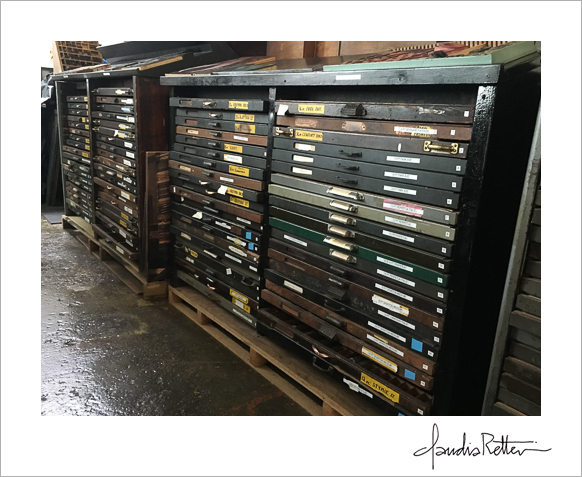 I drooled over all the rows of type in drawers. 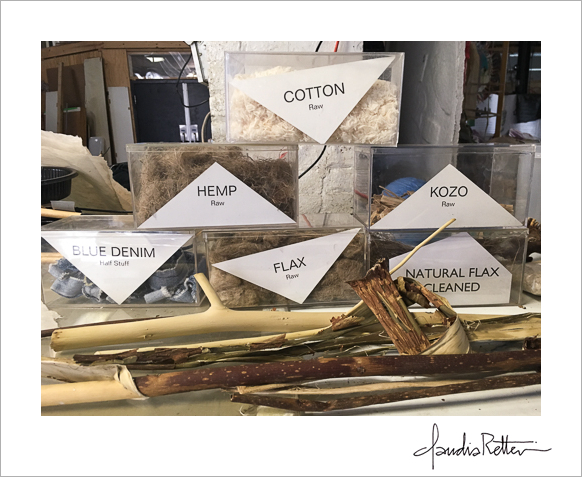 I know nothing about papermaking, but I love all the supplies. Curiosities were everywhere. I loved this sculpture—I don’t know if it was still being worked on or not—of what looked like a kinder, gentler version of a Little Shop of Horrors pod housing dried hydrangeas and twigs. I mentioned this briefly in the previous post, but there’s a wall display of different papers artists have made, each with a description of its origins and process. Line fibre flax, beaten ultra fine in a stainless steel Hallander paper beater and laminated between extremely thin translucent sheets of fibre flax handmade paper. I also got to see a sneak peek of the Morgan’s 2019 National Juried Exhbition—amazing works both on and made with paper— before it was even up on display. It opens March 29 and runs through April 27. Finding the Morgan was such a treat. I look forward to returning! It’s up! 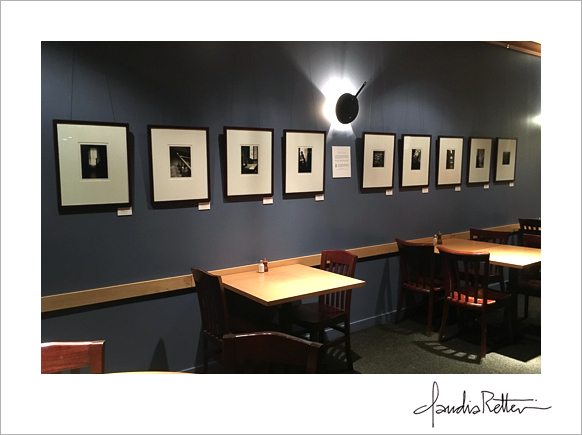 My exhibit at the Meadowlark Restaurant in Dayton runs from now through March. 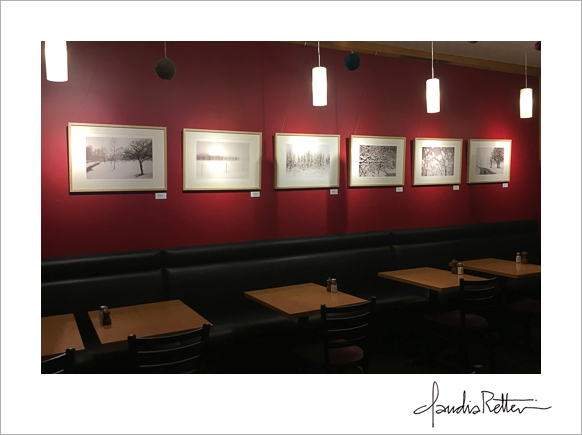 It was my original intention to just display my Velvet Winter series, but with all the wall space at the Meadowlark I was able to add a sampling of The Blue Hour and Enchanted Kingdom as well. It feels SO good to have photographs up on walls again! I’ve been working on the Flying Adventures book project for such a long time that my other work has taken a back seat, and this show couldn’t be a more perfect way to get that part of my photography life up and running again. I started by unearthing all the prints I had, signing and labeling them. Miss Hazel was, of course, helpful in every way possible: “No prints under here!” she says. 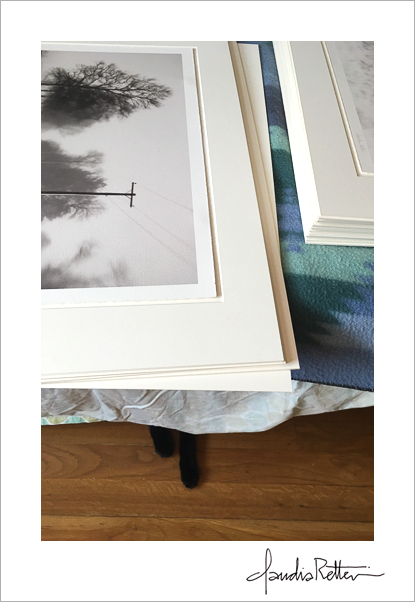 … and did my best to frame prints without the inevitable stray hair of kitten fur finding its way in. “Ooooh I think I see one right here!” Miss Hazel says. This was the first time I made wall labels and proper signs for a show. I thought that since each photograph had the same info (size, price, edition number, etc.) that I could just lump all of that together on the larger project statement sign, but I realized each photograph deserves its own. Besides, if someone’s interested in it, why should they have to track down the sign in the foyer? Each wall at the Meadowlark is unique. Two are brick but the rest are painted bold colors. I wasn’t sure if I’d like how the photographs looked on bright walls, but I love how the images pop! 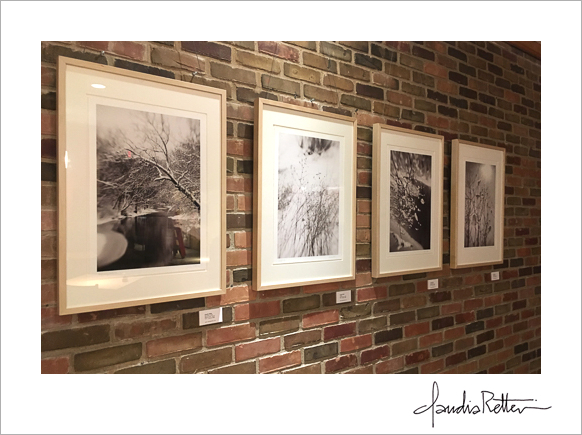 The foyer is home to two of my favorite images from the series, “Silver Forest” and the title piece, “Velvet Winter.” On busy nights when there’s a wait for a table, hopefully people will enjoy the snowy view. Thank you to Wiley and Lisa for the opportunity, and to John for all your help. SWANK AIRFIELD in Butler, Ohio. This grass strip (see it right behind the wing there?) is one of my FAVORITE places to go as it's got everything you could possibly want. You can camp right next to the river, go swimming in the summer, there's a shady gazebo for picnicking, it's right on one of Ohio's major bike trails, and there's an amazing diner right in town. It also has an old-skool water pump and a bathroom. The Recreational Aviation Foundation (RAF) is working hard to get places like this spiffed up and put on aeronautical charts. For a long time, Swank Field was a bit of a secret and not everyone knew where it was. (Hopefully it still kinda stays that way.) From our neck of the woods, just fly north-northeast, pass the south end of Delaware lake, keep on going until you pass in between two small-ish lakes. When you see the three radio towers in a row off to your left, look for the river and the town and swoop in over the valley. No GPS required! Butler is perfect for scootering, and we went straight down the bike path toward The Whiffletree. The Whiffletree, famous for its John Wayne decor, is closed on Wednesdays, and the last time we flew in I got so excited dreaming of their amazing home fries, only to have my hopes dashed by the CLOSED sign. (I think our airport home base needs to create a restaurant reference list of what's open when. Maybe a fun summer to-do list item...?) This was not a Wednesday, though, so all was well. Breakfast accomplished! NORTH BASS ISLAND in Lake Erie. First stop: Port Clinton for lunch at the Tin Goose Diner (there always seems to be food involved in these trips). It was our original intention to head to Kelly's Island, but we got a late start and really wanted to save that for a day when there was more time to ride around the island. The Tin Goose NEVER disappoints, and their soups are the best I've had ever. I always love looking at this part of the Ohio chart. Just past the Cedar Point roller coasters... all these little tiny islands with airstrips on them. We've gone to Kelley's and to Put-in-Bay, but not the others, so I asked John if we could try a different one, and we chose North Bass. We bought some cookies and hot cocoa to go at the Tin Goose, and took off. It was a perfect day for a cookie picnic. Most of the island was bought by the state in and is now North Bass Island State Park. People still live there, but not very many. It's beautiful from the air! I want to go back again when we have more time to go exploring. This little building is the post office and airport of the community, Isle Saint George. Somewhere on the island there's a museum in an old schoolhouse, and next time I'd like to go & find out more about the island's history. This was our picnic view. The beach was rocky, but there were enough flat spots to put down a blanket and have a nap. One of my goals this year was to learn how to fly again. I haven’t flown by myself since my solos when I was preparing for my license, and that was — gulp! — five years ago. (Technically I can’t even go up on my own again until an instructor puts me through my paces and signs me off as good to go.) When I look back at what was going on in my life in 2012, though, it was understandable. I pretty much lived in Florida, helping Mom take care of Dad, and then helping my brother take care of both of them. That time was so special and important to me. After they died, life was about taking apart our family house and, well, grieving all that went along with it. Flying — and just about everything else — was the last thing on my mind. I certainly didn’t have the mental commitment to hit the books again, which I’d need to do, nor the time commitment to show up at the airport regularly. It’s not as if I wasn’t up in the sky: I fly with John in the Starfighter and we’ve had many a happy adventure, so I started wondering if it really mattered that much whether or not I was an active pilot. I learned how to fly and I got my license, which is no small accomplishment considering that less than one quarter of 1 % of US citizens are certified pilots, and of those, only 6% are women. So, maybe it was enough just to say I did it… who says you have to keep up the same hobbies and interests forever? Last year though, the little yellow Aeronca Champ I learned how to fly in was for sale. (I still see it sitting in the open hangar at MRT when I showed up asking about lessons… stars on its wings just like Ryan’s Luscombe. It was meant to be!) A few of us at the airport got together and we bought the Champ, which made it super-affordable, and this would certainly be my chance to get back up in the sky by myself again. I was excited. An airplane that that I could just wheel out of the hangar whenever I wanted, without always having to be dependent on John to take me up. Not that I don’t love flying with John. It is, after all, how we met. But not being able to fly by myself is kinda like being stuck forever with a drivers’ license learners permit… you can’t go anywhere without an adult in the car. I also realize that when I fly front-seat with John, I tend to use him as a crutch: I know he’s back there and won’t let me crash into a tree or ground loop my landing. But I won’t become a better pilot if I always fly with training wheels, and on some level that would always leave me dependent on another person for my flying happiness. I always want to choose to fly with John, not have to. Just as the weather warmed up, though, the Champ’s engine seized during a ground run-up. John spent the summer taking it apart to figure out what was wrong, found a new engine, put it in… etc, etc. It was unflyable all summer. Meanwhile the Starfighter was down with an air leak we couldn’t locate. It was not a summer for flying, and so I didn’t feel very inspired. In fact, I was about ready to give up again. Why did I feel so ambivalent/discouraged? I think what weighed the heaviest was my fear that I’d really have to start from scratch again. It isn't like riding a bicycle unless you've ridden a bicycle for a good while, and I hadn’t flown in a LONG time, nor had I been at it long enough to really build much muscle memory. 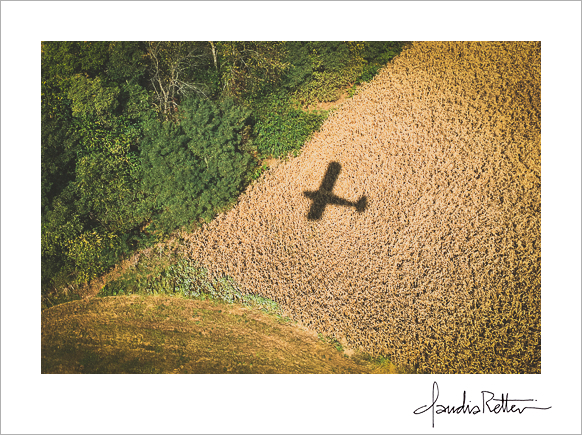 We flew over autumn in Ohio farm country. Yellow and green and ochre fields quartered by stick-straight country roads. We flew to Packer Field for a picnic under the wing. We flew in circles around little rain showers. The next morning we took off accompanied by our very own shadow. Magic! And so I felt it in my bones again: how could I not want to be able to get into this airplane and fly it on my own? On a day when popcorn puffy clouds are floating in the sky and a picnic is calling. As it turned out, I actually kinda sorta remembered how to take off and land, which surprised me. I kept asking John: “You didn’t secretly land for me?” “Nope.” he said. So now I am looking forward to slightly warmer weather and a 2018 that involves being able to fly on my own again. It’s so easy to convince yourself you’ve lost a desire for something when circumstances prevent you from doing it. When there’s baggage wrapped up in it too. Memories. Frustrations. Self-doubt. Not to mention the occasional complexities of having your flight instructor also be your husband. But like anything else you once valued that might not seem as shiny as it once was, don’t we owe it to that thing to give it at least one more go? How else do we find out if our lack of interest is legitimate or just a bunch of mopey self-chatter? So try it one more time. Whatever it is. On a day when there is magic out the window that will pull the this-is-why-you-loved-it-in-the-first-place up out of the hole it somehow got buried in. I sooo hope some of tonight's snowflakes stick around through tomorrow! If they don't, I wish you a Happy Christmas with a photograph made during a winter several years ago, when it snowed non-stop and every day was a cross-country skiing/photographing adventure in the muted wilderness of Columbus' outlying city parks. Join me on Sunday, June 11 at Phoenix Rising Printmaking Cooperative in downtown Columbus for a reading of my Flying Adventures book and accompanying art talk (which now has a proper title! ): Creative Persistence: Lessons From a Long-term Project. Details below. Phoenix's address is 243 N 5th St, Suite 140, Columbus, Ohio 43215. Hope to see you! Two summers ago I spent a magical week learning the art of photogravure at Renaissance Press in New Hampshire. Set on a riverbank next to a covered bridge, the studio is basically a renovated barn complete with original wood beam ceilings and 12-inch pine floorboards. The weather was perfect the whole time, and it was the kind of workshop where we students raided owner/instructor Paul Taylor’s garden for lunchtime salads and took our breaks on the deck overlooking the water. Bliss! I hadn’t printed any black and white photographs in many years. It’s taken me a while to figure out why, as I used to be a prolific silver gelatin printer. I think it’s a combination of adding digital cameras to my bag and also wanting to move away from silver gelatin, but not knowing where to go next. 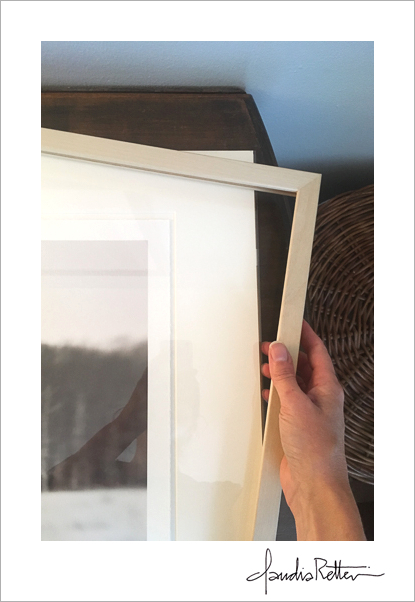 I’m an old-school girl too: I love the physical act of creating artwork, not just watching prints roll out of an Epson. I have always loooved paper and ink, getting my hands dirty. Making. When I learned about gravure, I was so intrigued. 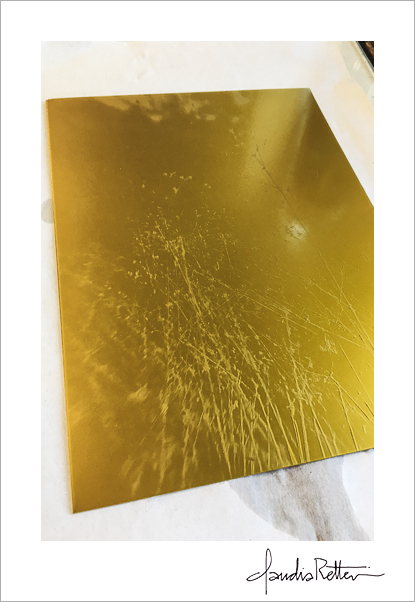 The process involves exposing a sensitized metal plate to light, which etches the image into the surface. The plate is then worked with ink and run through a press, transferring the image to paper. In its original form, gravure involves several chemical baths to sensitize copper plates. It's kinda finicky, expensive, and not very environmentally friendly. Buuuut... there are now aluminum plates that are pre-sensitized with an environmentally friendly coating that greatly simplifies the process. It’s interesting because while technically it is a gravure process, there’s a bit of a back-and-forth about what the “new” version is called. Photopolymer gravure? Solar plate etching? Polymer plate etching? At Renaissance, we learned some pretty technical stuff to get a good plate (including photoshopping, dedicated black & white transparency printing, step tablet tests, etc.). It was hard-core, but the results were consistent and beautiful. My problem was what to do when I got back home and didn’t have all this equipment. I wound up letting the whole idea go as I was working on the Flying Adventures book again. 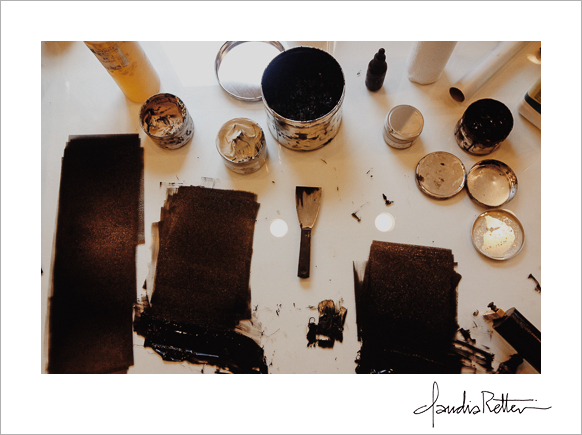 Last month, though, Anne Cushman of Phoenix Rising, Columbus’s printmaking co-op, was offering a solarplate etching workshop and I thought it would be a good re-introduction to the basics of the process. I loved it! Such a great location too: a bright, big-windowed loft space downtown. AND there’s a great cafe in the building! Hello! The whole place smelled like inks and art, which was inspiring in and of itself. They even kept the sign from their old location. Nice. It was amazing how much I’d forgotten, but also how much I remembered, and what I learned at Phoenix was a simplified version of what I learned in New Hampshire. We had our transparencies made at Staples (doesn't get any simpler than that!) and exposed them in a homemade UV lightbox. Anne said you could even just expose the plates in the sun if you wanted. I really liked that idea... something so elemental about it: The sun made this! Unfortunately it was cold and cloudy. No matter. I brought one of my winter images to work with, as it’s from the series I am hoping to print as gravures. Something about the hand-worked quality that seems to fit the moodiness of my winter scenes. Like you’re brushing snow off a window to reveal a landscape. Only it's ink. I think gravure is the perfect medium for that aesthetic. I was happy with my finished prints. They were less “perfect” than the ones I made at Renaissance, but I think that’s what I liked about them. They looked less like photographs and more like sketches.. I don’t know how that quality will manifest in the other, more tonal, prints of my series, but I am looking forward to finding out. I can't wait to try different inks and papers, and to experiment with printing my own transparencies using some of the techniques I learned at Renaissance. 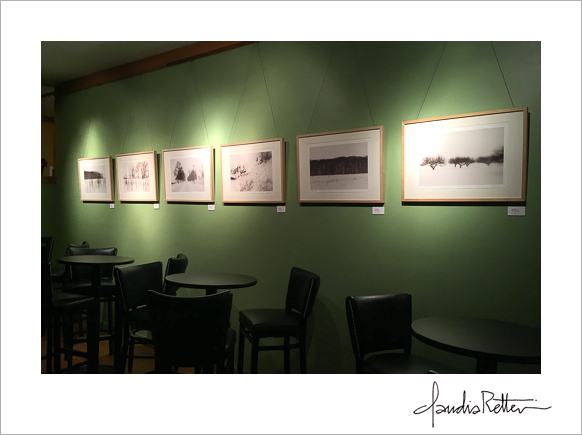 Most of all, I am happy to have found a place that will give me an art-home. I have a studio at my house which I love, but every now and then it would be nice to go OUT and work in a communal space. Have conversations with other artists working on their own projects. I don’t want to lose my black and white work in all the effort I’ve been putting into the Flying Adventures book, and I think that joining the community at Phoenix will be the perfect way to keep it up, try some new things, and meet wonderful people along the way. Thank you, Anne & Phoenix Rising... Hello again, printmaking!